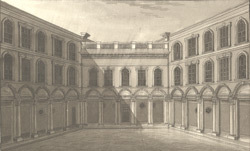 View of the quadrangle or inner Court of the Merchant Taylors' Hall. The Merchant Taylors were a Company of the City of London and traditionally they enforced the use of fair measures for the selling of cloth in the city and at fairs. Its Hall was acquired by the company in the fourteenth century. It can be entered by narrow entrances on Threadneedle St and Cornhill. As can be seen in the drawing it has a broad central courtyard. It was badly damaged in the Great Fire of London when it lost its interior and roof. This drawing shows it after its restoration by Edward Jarman, which was finished by 1671. It has a classical arcade and each side has alternate rectangular and arched windows.